It was a gloriously sunny afternoon in Cuckfield when we arrived at Ockenden Manor. 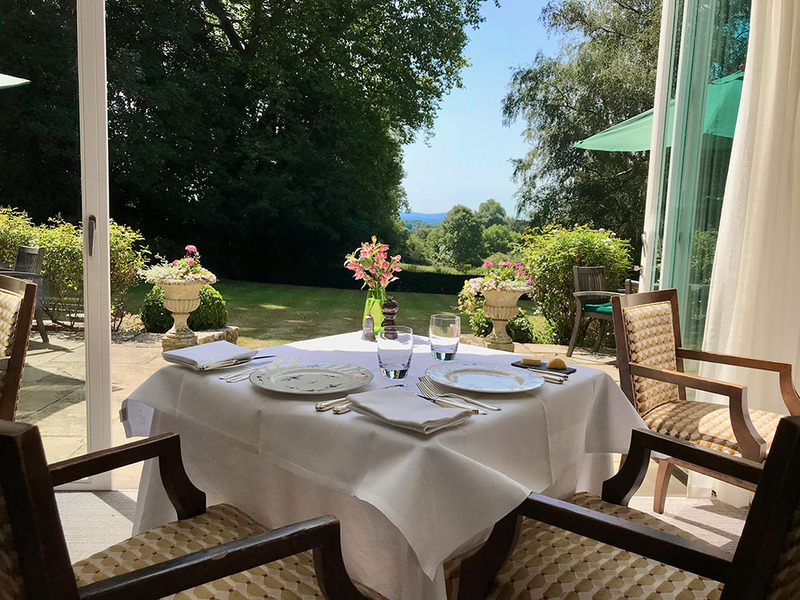 I can’t help feeling that this is the best time to arrive at this 500 year old traditional Sussex manor house – when its bathed in sunshine and the gardens sparkle in green delight. We are shown through to the dining room, which is a bright and airy space with design elements that satisfy both the traditional and contemporary palette. 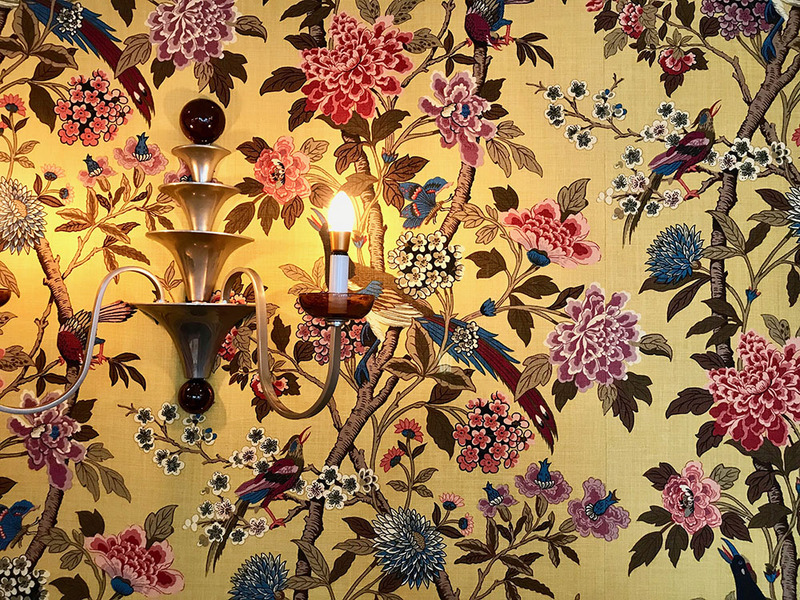 The crisp white linen on the tables, candle wall lights and a dado rail on the burgundy walls juxtapose with the modern large pendant lights hanging from the ceiling and bold, floral wallpaper. 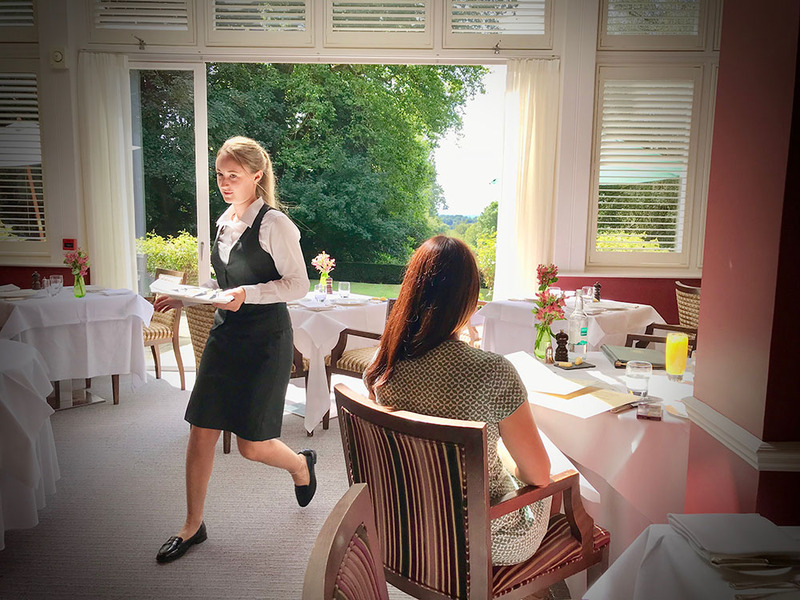 Its lunchtime on a Tuesday and so we are handed the A La Carte menu along with the Daily Lunch Menu. 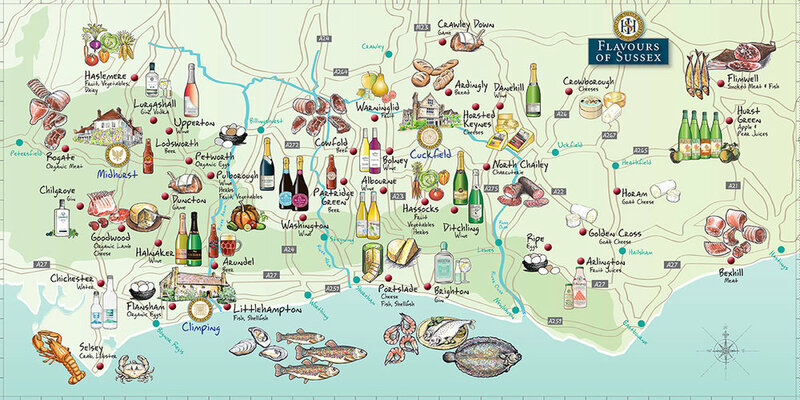 The full menu (priced at £65) includes Hand Dived Scallops and Carpaccio of Trenchmore Farm Salt Beef – both from local suppliers. 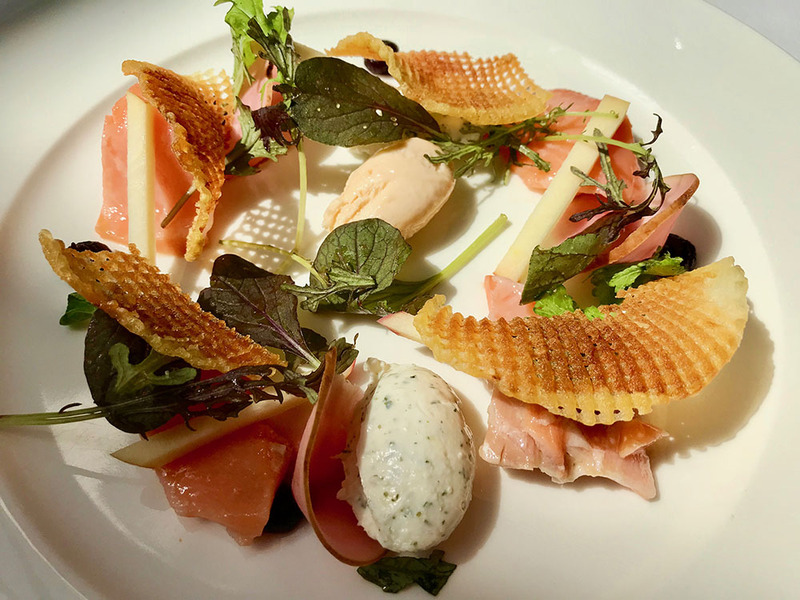 Something the chef – Stephen Crane – is passionate about. 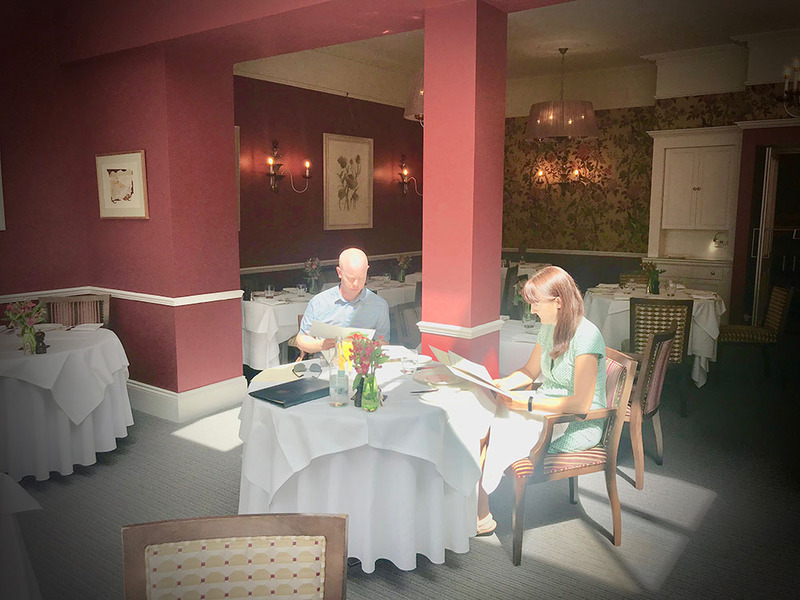 Emily and I enjoy a refreshing glass of sparkling water (filtered with love by the chalk beneath the South Downs, of course) while perusing the Lunch Menu in more detail. As we do so, we are brought out a delicious selection of breads. 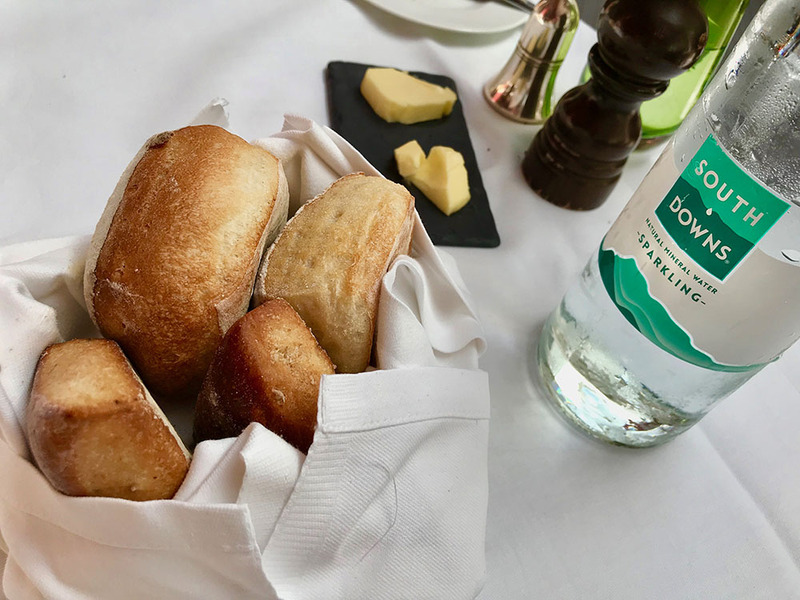 The favourite on the table was the wholemeal walnut loaf – beautifully warm, and crisp on the outside, with butter served on a simple grey slate. To start Emily has opted for the Confit Salmon, served with an assiette of beetroot, apple, horseradish and game chips. The salmon was ‘delightfully fresh’ and was lightly smoked – more akin to sushi in texture and taste. I, on the other hand, selected the equally cool Chilled Gazpacho Soup with rouille and croutes – but I must admit I went back for more of that tasty bread to accompany it too! 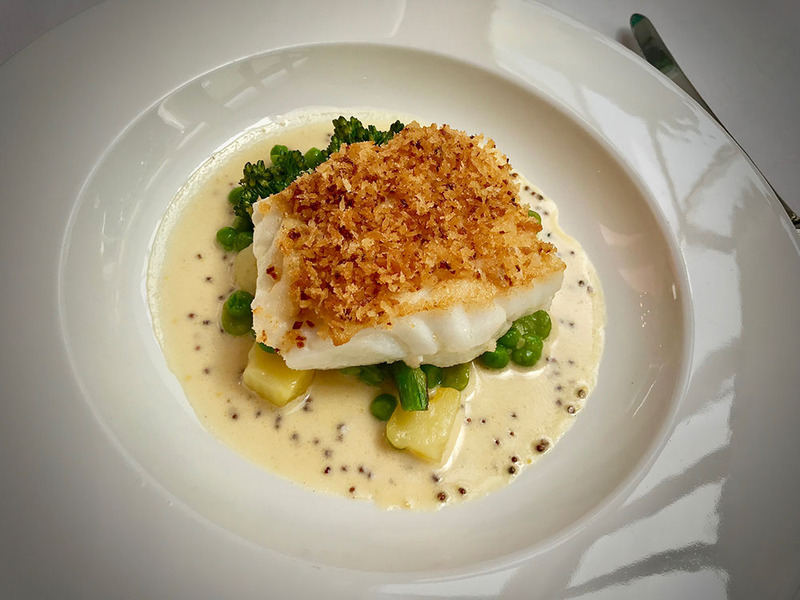 More local specialities next as my main course was Newhaven Landed Cod (topped with a very flavoursome crispy crumb) served with the most beautifully prepared Jersey Royals and peas, beans and tenderstem broccoli. The homemade fresh pasta had taken Emily’s eye earlier and she enjoyed the Provençale vegetables in a rich tomato sauce with baby spinach and large chips of parmesan. Both perfect meals for a (very) warm summer’s afternoon – when eating is the last thing on your mind. 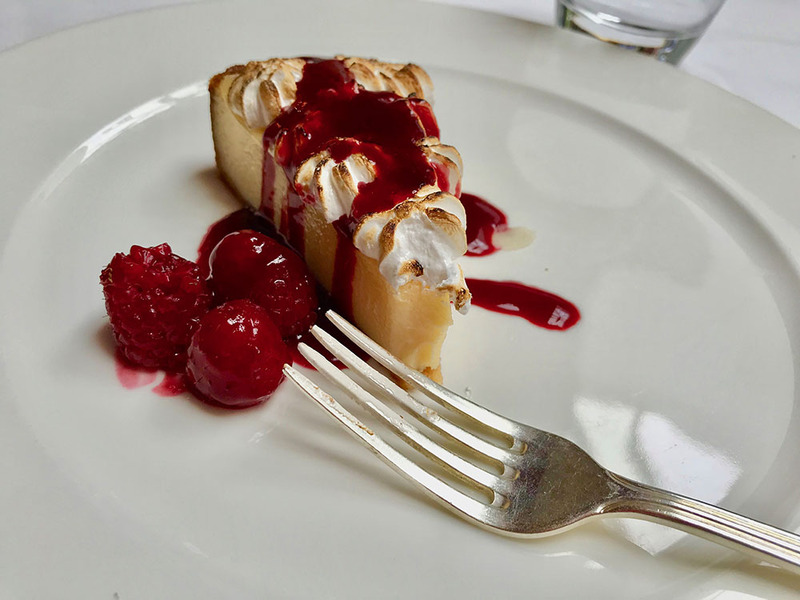 The two course lunch option is priced at £22 but I, for one, am not inclined to deny myself when you’ve got this kind of ‘foody talent’ at your disposal in the kitchen – so I happily selected the sublime Lemon Meringue Pie from the Dessert Menu. It was served with cluster of the most juicy and sweet raspberries I think I’ve ever tasted and a gorgeous raspberry sauce to drizzle over. The extra indulgence comes at a price of £7, whereas Emily decided she couldn’t resist the idea of fresh coffee and Petit Fours (£6) – which she was very happy about. Her biggest problem was the order in which to eat them! From the description of the salted caramel fudge cake – I’d say that was her favourite! 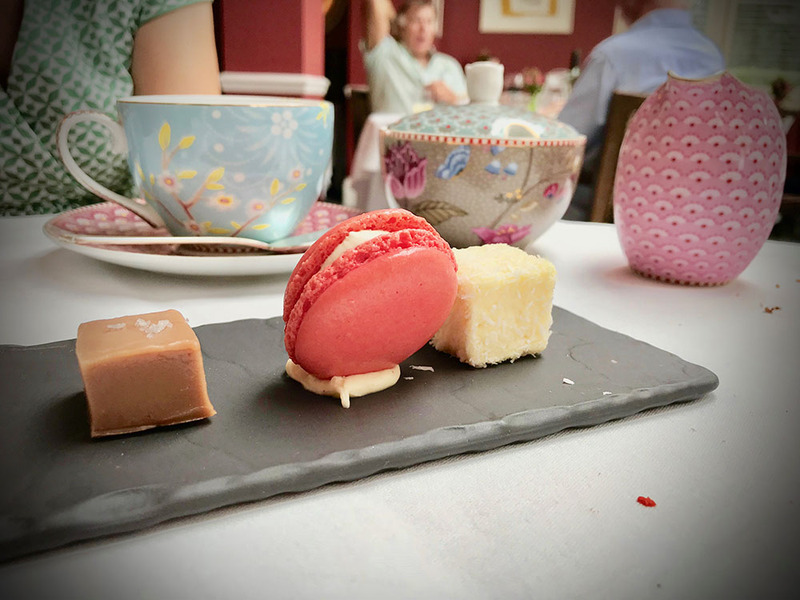 Oh and I should also note the beautiful crockery which came with her coffee; as with everything else at this excellent food venue in the heart of West Sussex – it looked fab and the taste was terrific too.